Is it possible to select an object and capture any information requested with the info Panel ctrl+8 in Illustrator, and F8 in Photoshop. 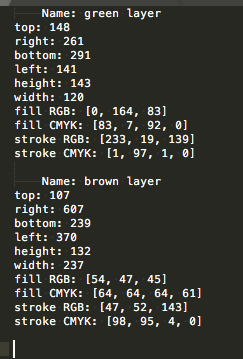 like the CMYK, RGB Values of the fill and outline colors? To be copied into the clipboard so it will be easier to paste it back in any other software? The reason that I have a bunch of colors in so many files I need to recheck and normalize it for the print shop. Is there any native method or any external scripts that do so in photoshop and Illustrator? Photoshop: This script will copy position, bounds, fill and stroke colors of selected Shape layers to clipboard — as I understand that's what you need. I don't know about Photoshop. Open the Document Info Panel and use it's fly out menu to save the info as a text file. Note that even though the Panel only shows one area of information at a time, when you Save the info each area is saved. Unfortunately, it's not going to provide things like color breakouts of each object (that could balloon a text file beyond belief). But I would imagine that could be scripted. Not the answer you're looking for? Browse other questions tagged adobe-photoshop adobe-illustrator photoshop-scripting illustrator-scripting or ask your own question. How to save a photoshop image for indesign and preserve the pantones? How to get consistent color in Photoshop when using the [Print Screen] command? How do I stop Illustrator from resizing partial screenshots pasted from clipboard?